This event will be chaired and led by Greg Coleman and Graham Scotton of Petromall. Greg Coleman is CEO of Independent Resources Group, an AIM listed energy company, and a former Group Vice President HSE and Security with BP. Graham Scotton is a former COO of Dana Petroleum and general manager of BP Angola, among other positions. The dreaded phrase " cessation of production" stares many assets and companies in the face in the present climate, and the word Decommissioning is writ large in many a boardroom and elsewhere. 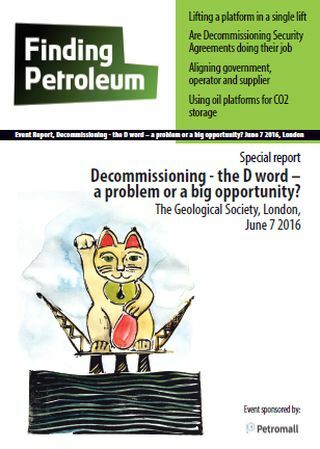 Finding Petroleum is pleased to invite you to a "Decommissioning Discussion and Debate" on 7th of June which will examine some of the key issues - financing and tax planning, the Decommissioning Project itself-notably planning, scheduling and cost estimation, the supply chain's view, the legalities and hopefully the views of the regulator. Various estimates of the value of the North Sea decommissioning market have been cited, from $30 to $50 billion over the next 30 years. Our session is intended to throw some light on current industry thinking, and its state of readiness to access this market, and meet the obligations. In particular, we hope to attract the London investment community in many forms to the session - institutional and private equity, insurance and debt providers - to stimulate creative debate on how to generate quality returns from an activity counter-intuitive to upstream oil and gas. Graham is a former COO and acting CEO of Dana Petroleum Ltd. Before that he had a long career with BP with his most recent roles being in projects offshore Angola and in the Caspian. Greg has over 40 years experience in the oil and gas industry including over 30 years experience with BP plc following which he served as CEO of a private equity backed company he co-founded called Canamens and subsequently as CEO of a listed company on the London Stock Exchange called Independent Resources plc subsequently refinanced and renamed now called Echo Energy plc. At BP, Greg served as Business Leader for BP Norway, Head of Investor Relations and finally as group Vice President for Health, Safety, Security and Environment at global remit before retiring in 2006. Other key elements, eg well P&A. Mark McAllister has been Chairman of The Decommissioning Company since its foundation in 2011. A Petroleum Engineer by training, he began working in the oil industry in 1979 with Conoco. Mark has held senior management positions in some of the most successful UK independents, including Monument Exploration (Director of Operations) and LASMO (Managing Director, Europe & North Africa). Since 2001, he has founded two UK independents which have played significant roles in the rationalisation of the mature North Sea and pioneered a new marine heavy-lift technology aimed at the growing decommissioning market. In 2009, Mark was awarded an Honorary Doctor of Technology from Robert Gordon’s University in recognition of services to the oil industry. Where are the main concerns – liability, risk, insurance, overspend? Opportunities for business – new players coming in? Bob Palmer is a senior partner in the Oil & Gas Team at CMS Cameron McKenna, a leading international law firm. He has specialised in advising companies in the oil and gas industry for over 25 years. Following his law degree at Cambridge University Bob joined McKenna & Co in 1985 and qualified as a solicitor in 1987. In 1989 he joined Shell and worked for Shell in London, Brunei and Australia. He became a partner in CMS Cameron McKenna in 1997 and advises oil and gas companies and service companies in many parts of the world on a range of work. Much of his work is M&A and advice on joint ventures and other commercial contracts, as well as advising on projects and development contracts. Bob’s recent work has been throughout Europe, Africa, South Asia and the Middle East. He is listed in Band 1 by Chambers and Legal 500 for Energy & Natural Resources and as a leading individual by Legal 500. CMS, which provides clients with specialist, business- focused advice in law and tax matters. Our 3,000 legal professionals across the world, working in sector-based teams and trained in project management, are focused on our clients and fulfilling their objectives. CMS lawyers operate in 60 offices worldwide, offering real-world advice to clients operating in a challenging business climate and a fast-changing regulatory environment. Our corporate lawyers provide advice across all types of commercial law; banking and finance, competition, corporate and M&A, dispute resolution, employment & pensions, environment, intellectual property, private equity, public procurement, real estate and tax. A look back at the decommissioning of the Frigg and MCP01 structures, at the ongoing plans to decommission the Brent facilities and a look forwards to potential advances in platform removal for the future. The first Frigg structures were decommissioned in 2005 and the project was completed in 2010. A field with similar offshore structures, Brent, is now ready to be decommissioned but using more advanced techniques and equipment. Christopher was formerly business development manager and strategic project manager with Reef Subsea, an offshore construction and survey company. He was the commercial manager for Reef Subsea for the company's part in the Fife, Fergus, Flora and Angus (FFFA) decommissioning projects. He is an experienced chartered engineer and operations manager having worked for the last 12 years in the North Sea and Norwegian Continental Shelf. During his time at Saipem UK Limited he worked on one of the North Seas first major decommissioning project for the Frigg field and MCP-01 in 2007-2008, requiring the removal of four steel jacket structures and six topside platforms. He is currently consulting in the offshore energy space, of which decommissioning is playing an increasingly large part. Christopher is on the national membership panel of the Energy Institute and the safety committee of the Royal Institute of Naval Architects, as well as several other industry groups. Pete Tipler is a Principal Consultant and Xodus Group’s Decommissioning Lead. In this role, Pete brings together Xodus Group’s multi-disciplinary capability and oversees strategic alliances with the supply chain. In addition, Pete is Xodus Group’s Environmental Impact Assessment (EIA) Lead. To support these roles Peter’s consultancy career to date has given him experience in marine, coastal and terrestrial decommissioning, environmental site selection, impact assessment, planning and management. Pete’s experience covers multiple industries including offshore oil and gas (including decommissioning), renewable energy (offshore wind, wave and tidal), and aquaculture. Pete’s project highlights include ongoing decommissioning support to Fairfield Energy, Statoil’s Hywind Floating Wind project approvals, and Chevron’s Captain Enhanced Oil Recovery project. He has a wealth of oil and gas project experience, including decommissioning, in the North Sea and West of Shetland. Pete’s management and leadership style is to be communicative, organised and results-focussed; with particular strength in synthesising multi-disciplinary information and keeping complex schedules with multiple dependencies on track. He has a particular interest in following appropriate logic in decommissioning and only doing the things that make business sense (challenging the rest). Aside from this he spends his spare time walking his dog and sailing. Our integration - we help you make the most of your development opportunities by using our connected expertise in reservoir, subsea, flow assurance and facilities management. Our resources - our integrated, teamwork-based business model helps us attract and retain the best consultants and engineers in all our specialist fields - so we consistently give you high-quality advice and service. Our knowledge and experience - many of our team members are recognised industry leaders, ready to share their extensive knowledge and experience of the energy industry with you. Our customer focus - Xodus is an owner-managed company. We take a sensitive, responsive approach to resolving our clients' needs and developing long-term relationships. Our independence - when you work with Xodus, you won't find conflicts of interest. Instead, we focus on finding the right solutions to meet your needs, working with your teams through the entire development cycle. Ben Holland specialises in handling multi-jurisdictional large-scale dispute resolution for energy-sector clients around the world. Ben’s practice focuses exclusively on energy-related disputes with particular emphasis on the oil and gas, LNG, power and utilities, renewables and mining sectors. Ben advises on disputes concerning the construction, operation and decommissioning of oil and gas production facilities and equipment, pipelines, onshore and offshore engineering, power and renewables facilities. Legal 500 2015 says he is “excellent for tricky, high-value disputes”. Chambers UK says he is a “true energy disputes lawyer” and is highly recommended by market sources for his arbitration expertise. We combine sound legal counsel with a deep knowledge of our clients' businesses to resolve their legal challenges. We care about the quality of our services, the success of our clients and the relationships that are forged through those successes. Our client base spans every type of business, both private and public, worldwide. We advise a diverse mix of clients, from Fortune 100 and FTSE 100 corporations to emerging companies and from individuals to local and national governments. In the private sector, we provide the full range of legal advice required to implement practical strategies and resolve disputes. In the public sector, we counsel governments on privatization of whole industries and on establishment of regulatory systems under which new private businesses can compete. We also serve the regional needs of the countries and cities we call home. Michael Davar is a UK qualified lawyer specialising in international dispute resolution and litigation. Michael advises on a range of complex multi-jurisdictional commercial disputes for various clients including offshore contractors, oil and gas operators, shipowners, charterers, cargo owners, brokers, shipbuilders, banks, private equity, information technology companies and high-net worth individuals in arbitration, litigation and mediation in London, Singapore and Australia. Prior to entering the legal industry, Michael worked as a forex and fixed income trading analyst at the Hedge Fund, Nau Capital LLP. He holds degrees in law and economic history and speaks several languages including Russian and Georgian.